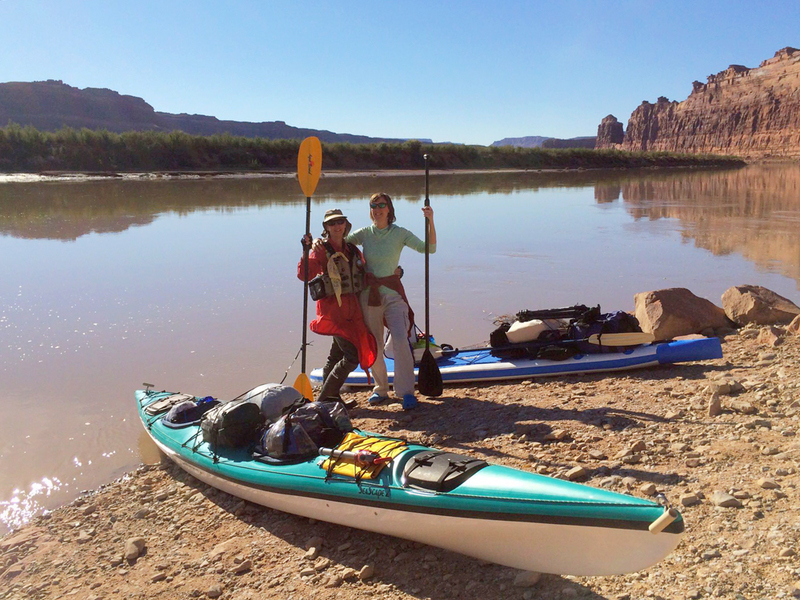 Jacque and Colleen just seconds before beginning our paddling adventure on Lake Powell just north of Hite (at the North Wash/Dirty Devil take out) last Tuesday morning. iPhone photo courtesy of my Dad, Bob Miniuk. After three absolutely spectacular days paddling almost 40 miles on Lake Powell, on Friday morning, my Mom and I found ourselves in terrifying 6-foot swells (per the park ranger’s estimation) in between miles 110 and 106, where we feared for our own – and helplessly, each other’s - lives for over three hours along the towering cliff walls. We are physically unharmed, but are emotionally shaken. A park ranger in police rescue boat literally just happened to pull into Forgotten Canyon on his rounds, where my Mom and I had taken refuge out of the winds and waves along a two-foot spit of sand at the base of a large talus slope no more than 10 minutes before his arrival. In talking with him, he suggested conditions were going to get worse over the next 6-7 days with a large storm from California dropping more south than expected (which explained the swells despite having a “clear and calm winds” forecast…) and that a second storm following behind it. Having just survived scary conditions, my Mom and I could not see ourselves enduring “worse” than what we experienced. We are not above or stronger than Mother Nature. We accepted a ride from Forgotten Canyon to Halls Crossing from the park ranger on the rescue boat. My Dad picked us up from there yesterday afternoon, and we are now home. Our glorious 4-day, 40-mile adventure through gorgeous canyons – no exaggeration, we had some of the best times of our lives out there together. Might have been shorter than expected, but it was certainly no less epic! Help from complete strangers, especially NPS Rangers Anthony and Marty, when we needed it most. The amazing support from our family and all of you as we took on this journey. Stay tuned for more, including all the details of this unforgettable and incredible adventure on Lake Powell…I’m writing our amazing story as fast as my little hand can go. Once again, we’re so thankful for all of your encouragement and support! Quite the story, Colleen. Wow, sounds like you’ve had a life changing year on a number of levels. I appreciated your perspective on this experience and your understanding of the big picture. In the final analysis, as scary as it is, as long as we live through the experience, it is probably good to be reminded from time to time of the absolute power of Mother Nature and how small each of our lives is in her balance. Maybe if we drain “Lake” Powell and fill Lake Mead, rather than having two half-empty reservoirs (optimistic), the issue and challenge will be over, for better or worse. I appreciate your emphasis on gratitude as well. Excellent post. Thanks so much for your comments, David! I feel fortunate for this opportunity I had with my Mom and for the chance to take another stab at this trip along Lake Powell in 2017…before it too possibly disappears…wouldn’t it be grand to see the Glen again? Fingers crossed it happens in our lifetime…!! Cheers to a great 2016 for you!